Accepted Scientific Name: Pelecyphora strobiliformis (Werderm.) Frič & Schelle ex Kreuz. 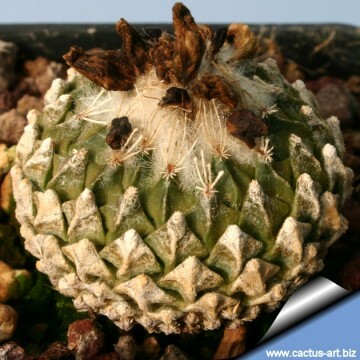 A very slow growing, choice Mexican species, commonly called the ''Pinecone Cactus'' for its resemblance to a pine cone. Origin and Habitat: Nuevo Leon, Tamaulipas, and San Luis Potosi, Mexico. The species has an estimated population size of more than 100,000 individuals. It reproduces well. Altitude: Up to 1600-1900 metres above sea level. 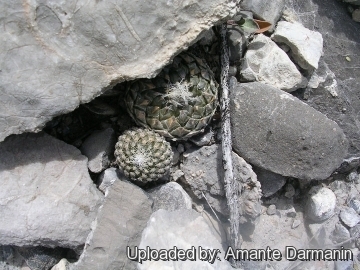 Habitat: This species is found in typical Chihuahuan Desert, among outcrops of calcareous rocks together with Turbinicarpus schmiedickeanus, and Mammillaria albicoma. 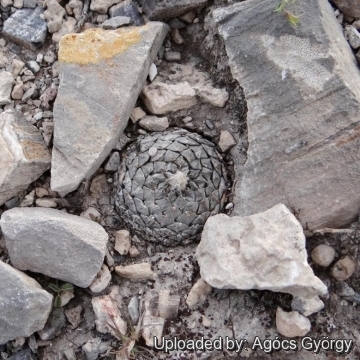 The stems are normally flush and well camouflaged with the soil surface resembling limestone chips in shape, colour, and texture, rendering the plants extremely cryptic. They are greyish-green in colour, sometimes taking on a yellowish tint with age. These cacti are difficult to spot in their natural habitat. When they are found, it is usually due to their pinkish flowers. 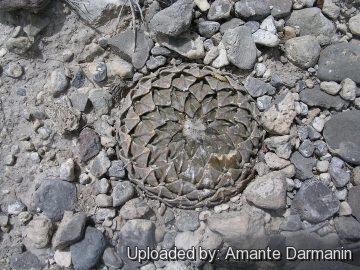 In times of severe drought, the whole above-ground portion of these plants can shrink and be covered by rock fragments, but the taproot remains alive. Many exist as only small, isolated populations, and there are no major threats to this species. There is some illegal collection. 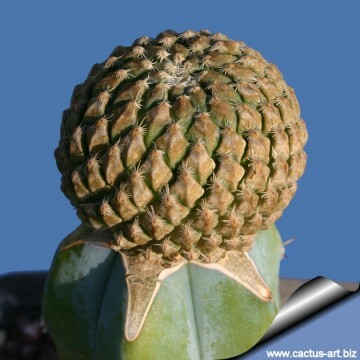 Pelecyphora strobiliformis (Werderm.) Frič & Schelle ex Kreuz. Pelecyphora strobiliformis f. cristata hort. Encephalocarpus strobiliformis f. cristatus hort. 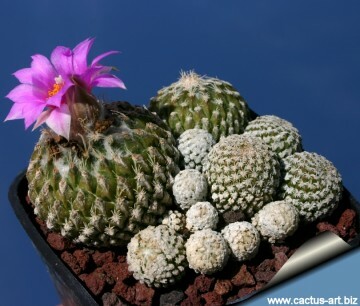 Description: Encephalocarpus strobiliformis, formerly known as Pelecyphora strobiliformis, is a slow-growing geophytic succulent, with solitary or multiple stems barely rising above ground level. Remarks: Although adult specimens of Encephalocarpus strobiliformis bear scale-like tubercles, which are very different from the laterally compressed tubercles of Pelecyphora aselliformis, all the other characteristics clearly show that they are congeneric, while a third species, Pelecyphora valdeziana, does not seem to clearly belong to this genus, and it is now brought into synonymy with Turbinicarpus. 6) Fitz Maurice, B & Fitz Maurice, W.A. 2013. 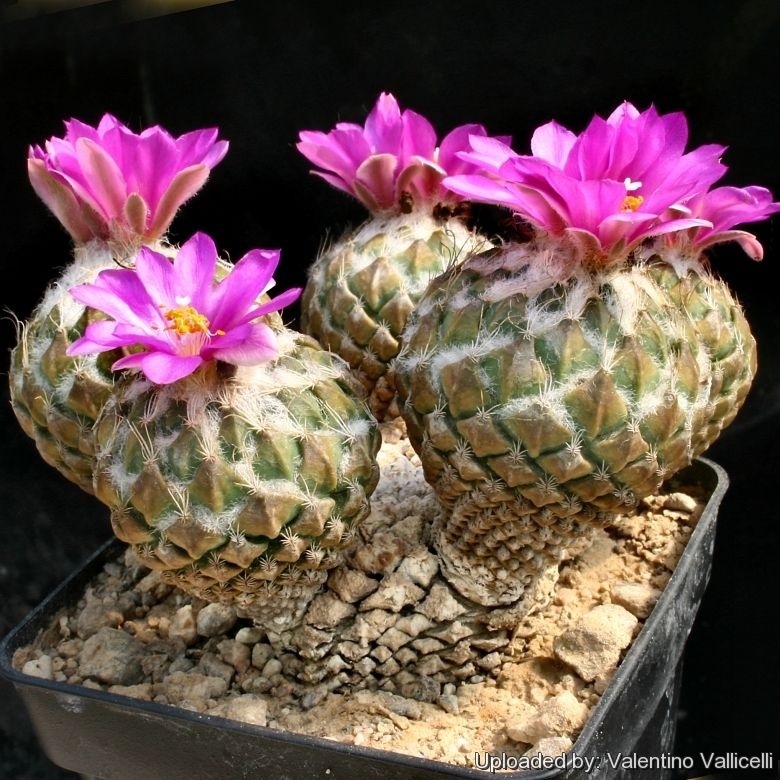 Pelecyphora strobiliformis. The IUCN Red List of Threatened Species. Version 2015.1. <www.iucnredlist.org>. Downloaded on 21 June 2015. 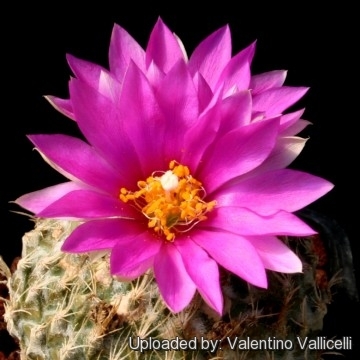 Cultivation and Propagation: It’s a fairly easy species to cultivate, but very slow-growing. 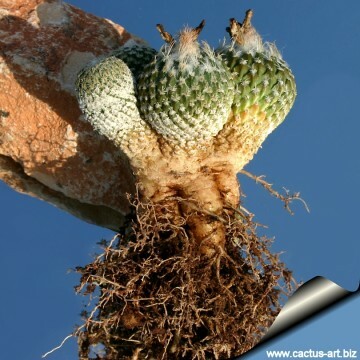 It needs a very well drained soil, and requires strong sun to part sun to develop good spinal growth. Waterings should be rather infrequent, to keep the plant compact and avoid it becoming excessively elongated and unnatural in appearance. Keep dry in winter or when night-time temperatures remain below 10° C. It is hardy to -4°C for a short period. Assure good ventilation. Propagation: Old plants put forth basal shoots, but growth is slow. Propagation is mainly by seed.